A few days back Nokia has released Nokia Situations that will enable the Nokia handset users to customize their handsets in a situation-specific manner.That is, users will be able to set the way in which they want their handset profile to act in specific situations. Nokia Situations automatically senses the situation you are in based on time, day, location and available network cells or acts according to the predefined situation. It then switches to the set profile that meets that criterion. The application silently runs in the background, senses the situation you are in and then changes the profile accordingly. The application is one of the best Apps we have used so far which uses all the sensors in a phone’s Hardware including GPS, Bluetooth, Wi-Fi, Network cells and what not packed with every permission to access phone’s hardware. You can also name your very own situation. Change Ringtones, make the phone go silent or louder, turn vibration on/off. Open a Web bookmark or application. Want to see weather forecast for the day when you wake up? Look at the calendar as first thing? Or open your favorite TV show discussion page at show time? Or perhaps change the Device Mode when at work? Scheduled. Set period of time, Set active days, Set during active calendar events. Connectivity. Wi-Fi (when in range), Bluetooth. This app silently manages to change the situations/Profiles that one cannot even notice without touching the phone. It automatically switches the profile back to preset situation though a manual change of profile action took place by mistake. We have tried a specific situation that automatically changes our profile when we get into car, connect to Hands free and then automatically launches the Nokia Maps application to start Navigation. Sounds interesting, isn’t it? It also senses our location based on GPS and Network cells, so that it automatically switches to meeting when we are at office and then switches back to selected profile when we are back to home. You can even set bookmarks to launch automatically along with applications, so you can set your favorite website to launch at specific times, or when in range of particular Wi-Fi networks. 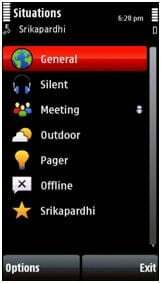 The ultimate goal of this application is to make one’s device more user friendly, conserve power and time of the user. This app is still in beta stage only.so, we cannot promise exact functioning though it worked flawlessly. Although it has some Bugs related to screen unlocking, we think it’s a good start and that future apps have scope to perform most of our work easily and automatically. This App is free of cost and can be downloaded from here provided that you have a Nokia Beta Lab account.We do love to hear if there are any more interesting situations you created by using this app and let other readers know. We love the application and do you? Application Availability: S60 3rd Edition (Feature Pack 2), Symbian 5th Edition, Symbian^3. How Telecom Industry Can Protect India Against 13 Million CO2 Emission? Is there any better phone beside HTC wildfire & SE X10(can’t afford this) within my range of Rs12000- 15000. Sorry, date has been postponed till Wednesday. After purchasing a better one by considering all of your suggestions, I’ll be happy to share it here.